After hearing warnings that a ban on supergraphic signs in Hollywood could have such dire consequences as stopping new development and forcing businesses to close their doors, the City Planning Commission Thursday directed the planning department to come back next month with more details on why the ban proposed by City Council President Eric Garcetti is needed and what potential effects it might have. Donelle Dadigan, owner of the Hollywood Museum, told commissioners that without revenue from supergraphic signage the museum in the historic Max Factor building on Highland Ave. would have to close it doors. And Gilbert Smith, manager of the Ricardo Montalban theater on Vine St., said that without the $15,000 a month the theater has gotten from supergraphic signs for Nike, Kobe Bryant, and Livestrong, it might also be forced to close, although he conceded that the signs weren’t legally permitted. 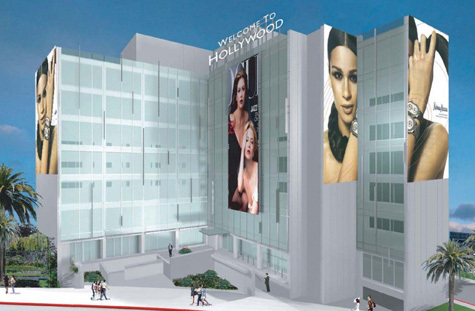 Development company lobbyists and sign company representatives warned that without revenue from supergraphic signs, financing projects could be very difficult, and severely impede development throughout Hollywood. Katherine Hennigan, planning deputy for Garcetti, told commissioners that the councilman believes that supergraphic signs have contributed to visual blight. She said that allowing supergraphic signs made sense in the beginning stages of Hollywood redevelopment, but was now serving to drive up land prices and make developments more expensive. Brian Curran, of the preservation group, Hollywood Heritage, said that huge supergraphic signs advertising consumer products badly detract from the architecture and historic nature of Hollywood’s core area. Supergraphic signs are currently banned citywide, but allowed in the Hollywood sign district, which is centered on Sunset and Hollywood Blvds. The multi-story signs hung on or adhered to the walls of buildings are part of a billboard takedown program, which allows projects two square ft. of supergraphic signage for every one square foot of conventional billboard removed. In practice, very few billboards have been removed because developers were allowed to pay in-lieu fees to the Community Redevelopment Agency. Commission President Bill Roschen, who has worked as an architect on Hollywood projects that included supergraphic signs, said he considered the takedown program very important, and was concerned that a ban on legal supergraphic signs would remove the incentive for removing billboards. He also said that much of the new development in Hollywood occurred because of allowing such signage, and expressed great concern about banning it. Only Commissioner Fr. Spencer Kezios opposed delaying a vote, saying he had no problem with banning the supergraphic signs. The commission is expected to take up the matter again at its Aug. 26 meeting. For more on the proposed ban, go here.